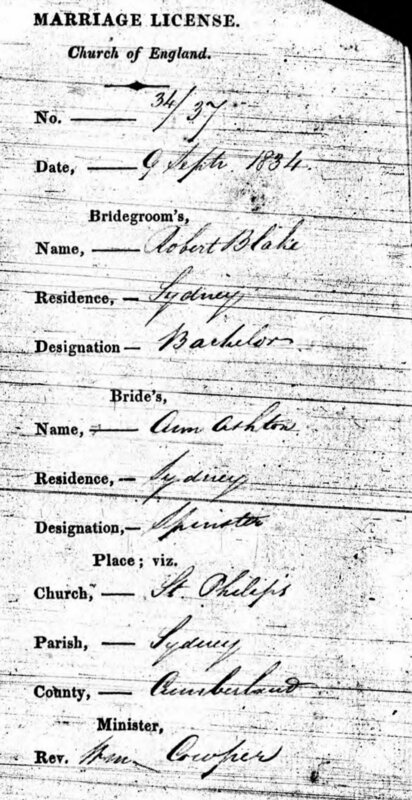 » BLAKE Family BLAKE Family | Cape Banks Family History Society Inc.
Robert BLAKE married Ann ASHTON on 9th September 1834 at St. Philip’s, Sydney. Henry Giles BLAKE was born 28th May 1838 at his father’s residence “Mount Shamrock”, and died 3rd October 1838 at his father’s residence at “Mount Shamrock”. 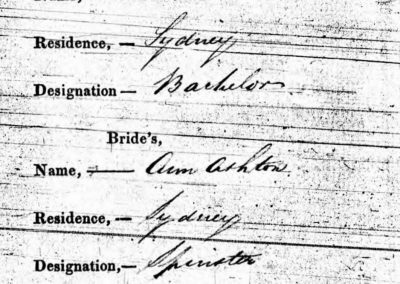 Ann BLAKE, wife of Robert, died 10th July 1840 at her residence, “Moorefield Lodge”, Balmain. After the death of first wife Ann, Robert married Mary ASHTON/BLAKE (who may have been his first wife’s sister). Robert McDonald BLAKE born 24th February 1848 at “Mount Shamrock”. Eleanor Maria BLAKE born 17th November 1849 at Devonshire Street, Strawberry Hills. D’Arcy Stephen BLAKE died of scarlatina on 12th June 1855 at “Blake Vale”, Balmain, aged 7 months. On 5th November 1870 Eleanor Maria BLAKE, only daughter of Robert BLAKE of “Blakewood”, Hunters Hill, and grand-daughter of the late Peter BLAKE of Lismore Castle and Moorfield, county of Galway, Ireland, married Edward Maber SPARKES at All Saints Church, Hunters Hill. Robert BLAKE died at “Blakewood”, now “Kareela”, 6 Mount Street, Hunters Hill, on 11th July 1875, aged 69 years. Ann, wife of Robert BLAKE Esq of Mount Shamrock. Died 10th July 1840. Also D’Arcy Stephen BLAKE 2nd son of Robert & Mary BLAKE of Mount Shamrock, died at Blakevale, Balmain 12th June 1855 aged 7 months. Robert BLAKE was a soldier & sheriff in the colony and a builder and a well respected & influential Gentleman in the colony. He built “Clontarf” in Balmain. Although he had requested his body be placed in the same Roman Catholic cemetery in Sydney in the Family vault with his first wife, Ann, and the two boys, the family had his remains placed in the churchyard of St Anne’s at Ryde. Further tragedy struck on 29th April 1877 when Robert McDonald BLAKE died at Blakewood aged 28 years. 2nd wife Mary Aston BLAKE died July 1896 aged 75.